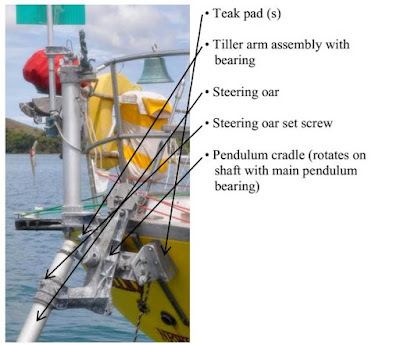 I began writing this description of how we set up the wind-vane self-steering gear on our boat primarily as a response to somebody from the Mason Sailboat Owners group. But I figure it might be worth sharing more broadly. 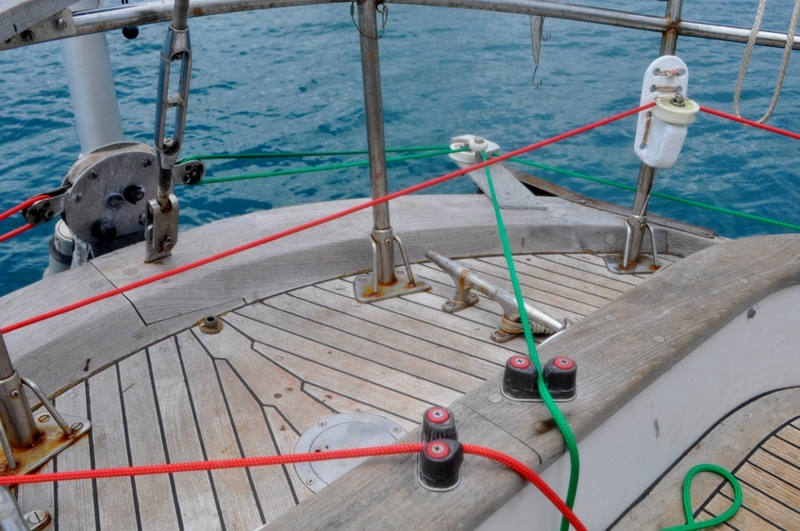 In the perennial debate regarding the virtues of autopilots versus those of wind-vane self-steering units (ours is a servo-pendulum device), we find ourselves firmly on the side of wind-vanes, at least for boats more or less like ours – not too fast, moderate size, aft cockpit, tiller or cable steering, etc. Obvious advantages of wind-vane servo-pendulums over autopilots include that they are robust, relatively simple and easy to repair, and require no power and thus do not depend on the boat’s electrical/charging system. 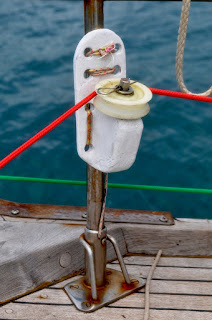 Moreover, should your steering cables fail, you can easily hook up the wind-vane servo-pendulum to your emergency tiller.The disadvantages include … well, I don’t really know. Our own preference is for units that use the boat’s own rudder to steer the boat (as opposed to ones that incorporate an auxiliary rudder). Under normal circumstances, it seems to make sense to use the rudder that was designed for the boat instead of a one-size-fits-all auxiliary rudder. Arguments touting the safety factor of having an auxiliary rudder just in case the main rudder fails become less persuasive when you consider that the main rudder must surely be far sturdier than any auxiliary rudder, especially compared to the keel-hung rudder on a boat like ours. 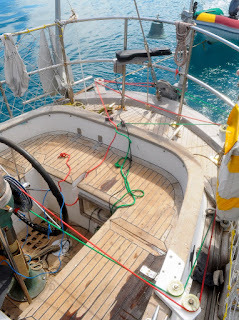 But, of course, situations exist where the use of an auxiliary rudder is more appropriate (hydraulic steering, for example, or poorly designed main rudders). 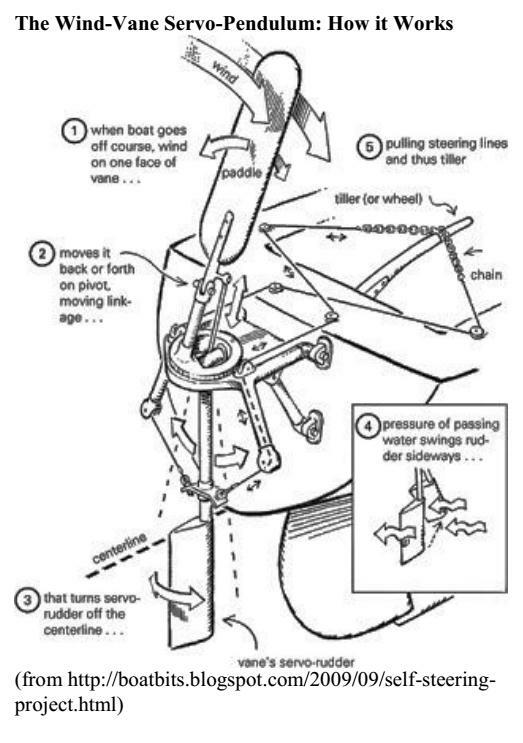 Certain specific features of a boat – hydraulic steering, center cockpits, dinghy davits – can conspire to make wind-vane servo-pendulums less attractive (although not necessarily prohibitive, and there are wind-vane alternatives to servo-pendulums). But they don’t play a role for boats like ours. Performance has never been an issue. We’re aware of various reports about the poor performance of wind-vanes on certain points of sail or in light air, but that hasn’t been our experience and we wonder sometimes whether there’s more to the story. An acquaintance, for example, who had sailed all the way across the Pacific to New Zealand, complained about the inadequate performance of his Monitor wind-vane, but when we reconfigured the blocks and lines to double the length of line travel this made all the difference in the world. 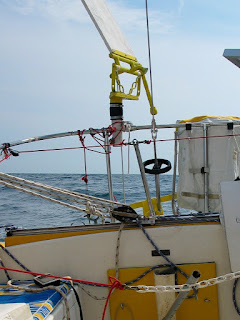 Our wind-vane unit works well in light wind and on all points of sail, while in really nasty conditions -- conditions in which we’ve seen autopilots pushed to the point of failure -- it really shines. Meanwhile, the argument that one needs an autopilot when motoring holds no water because, instead of using wind, you can also operate the wind-vane servo-pendulum with an inexpensive, low-energy tiller pilot. To be sure, setting the wind-vane self-steering device involves a little more thought and effort than punching a compass heading into an electronic device. Basically, you need to understand the wind-vane device as part of a much larger mechanical system that includes the rudder, keel, and sails. This system needs to be balanced as a whole, and the nature of this balance depends very much on the speed and constancy of the wind, as well as the conditions of sea. This takes a little practice, but for us also forms much of the challenge and pleasure of sailing. We get our kicks not so much from going fast (although speed is good) or pushing the boat to its limits (which for cruising just seems stupid) but from balancing between the shifting forces of the wind and waves a machine that draws its energy entirely from the wind and water. That said, it’s not as if we’re constantly fiddling with the self-steering gear. In fact, the boat practically sails itself. Once the gear is properly set, we just keep an eye on things and monitor the balance. Commercially available wind-vane self-steering devices are admittedly expensive, but their upkeep is minimal and you can usually fix them yourself using self-fashioned parts, if necessary. We’re talking here about a basic mechanical device rather than hi-tech engineering and electrical components. 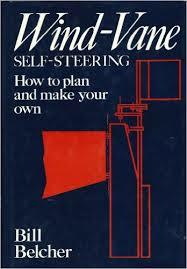 Indeed, you can also build wind-vane self-steering units yourself. If you can get your hands on it, Bill Belcher’s Wind-Vane Self-Steering: How to Plan and Make your Own will tell you everything you need to know in order to make a number of different kinds of wind-vane self-steering devices, with and without auxiliary rudders, with and without servo-pendulums. Years ago, I used his book with some success to build a wind-vane servo-pendulum for our 28’ Pearson Triton out of various bits of wood, epoxy, aluminum, and plumbing. The design drew its geometry from Belcher's book. 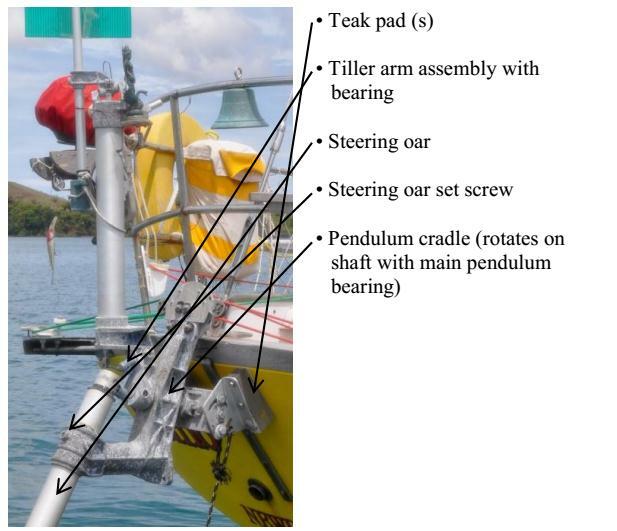 Which brings me to the original point of this post, namely, to show in (perhaps excruciating) detail how we've set up the Sailomat 601 self-steering gear on Momo. In certain respects, our approach deviates from the manufacturer's recommendations. But the system has worked very well for us, and it might give people some ideas when setting up similar equipment on their own vessels. Because of the angle of the Mason's transom, the base of Sailomat 601 cannot be attached directly to the transom. The aluminum mounting brackets do not allow the base to be sufficiently adjusted. So we mounted these bracket on two angled pads of teak. The pads are glued to the transom directly below the toe rail and, together with the aluminum brackets, through-bolted to the transom. blue powder coat on the cast aluminum parts (no longer found on the newest models) did more harm than good because it encouraged fierce and destructive corrosion. We stripped it all off using paint remover back in 2009 and left the castings bare. 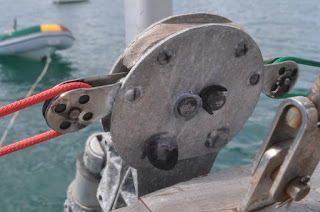 Another annoying problem on our unit was the fact that the steering oar was held in place on the cradle by a single set screw, which tended to work its way loose. Twice we’ve had the oar slip out of the cradle completely (thankfully, we had it tied on), which also damaged the little tiller arm bearing. Once this also badly bent the 12mm stainless steel axle for the tiller arm, which we replaced in a remote anchorage with a piece of a fishing rod. The set screw is now pinned in place; we’ve added a second set screw, and we also filled the space between the oar and the cradle with epoxy in order to eliminate the free play that has developed over the years. Early on, we also had problems with the main pendulum bearing, which for some reason became seized after being in the stored position for a few months. For a long time I simply made new bearings from epoxy and fiberglass cloth until we eventually bought a new shaft and bearing from the manufacturer. The point here is not so much that wind-vane self-steering units don’t break but that when they do you can often fix them yourself with materials on hand. The Sailomat comes without blocks or sheaves (unlike the Monitor, for example). You need to configure and install them yourself. But we found this to be a good thing, because it allows you to set up the blocks and lines in a manner that suits your boat. We utilized the entire width of the Mason 43’s (rather narrow) transom, installing angled brackets that extend from each corner of the transom. 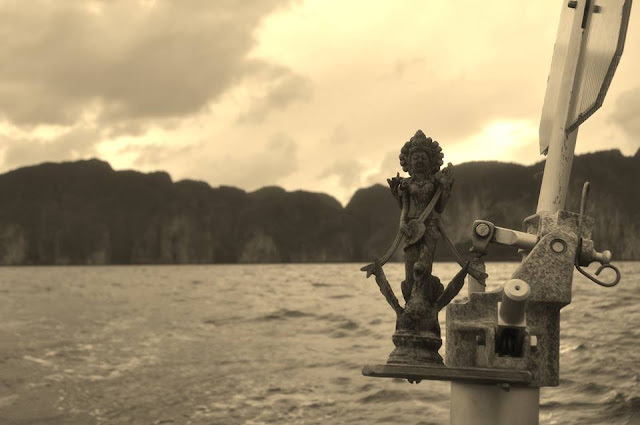 The line of travel from the top of the pendulum cradle to the blocks on either side should run straight across the boat. The brackets need to be strongly braced because the ends that attach to the toe rail are otherwise subjected to a lot of leveraged force (a physics lesson we learned from experience early on when one of the brackets tore out of the toe rail and fell into the drink). We’ve run the lines in a way that largely keeps the cockpit clear. The Mason 43 has a starboard side entrance, so it makes sense to have the lines cross to the wheel from the port side. Apart from this crossing point, the lines are kept outside the coaming, which makes for more seating space. While it might be aesthetically appealing to have the lines and blocks hidden away, as with the Cape Horn servo-pendulum gear, it seems far more prudent to have them completely accessible for when things go wrong. Which they will. The wind-vane self-steering unit is balanced by adjusting the lines at the cam cleats on the aft coaming. 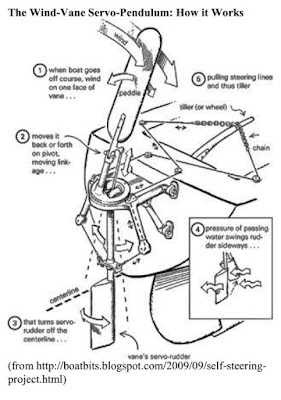 Adjusting the lines changes the “neutral” position of the wheel, thereby setting the rudder’s initial on-course position in a way that compensates for weather helm and other balancing issues. Even minor line adjustments of an inch or so can make a significant difference to performance. In principle, the idea is to set the lines so that the boat is balanced with the wind-vane in a neutral position. But this does not always achieve the best results. Sometimes it is better to set the gear so that it is always working a little bit. In so doing, you’re adjusting for the fact that in most situations the boat tends to go off course more in one direction than the other. Note the one pulley mounted on the pushpit stanchion (and stop looking at the rust on the stanchion base). Because it is situated in the corner of the pushpit, this stanchion is very solid and does not move. But I would not otherwise recommend attaching blocks to stanchions or rails because they will work back and forth and no doubt eventually break. We originally ran the lines through blocks, but later we moved to fixed pulleys mounted on 1/2” inch studs, a solution that we found not only more pragmatic but also less expensive than blocks. The pulleys are also easily cleaned and lubricated, and we keep a number of spares. Larger pulleys are easier on the lines and accommodate more line deflection. Incidentally, the Sailomat manufacturer recommends ball-bearing blocks, but they don’t last as long as plain-bearing blocks. 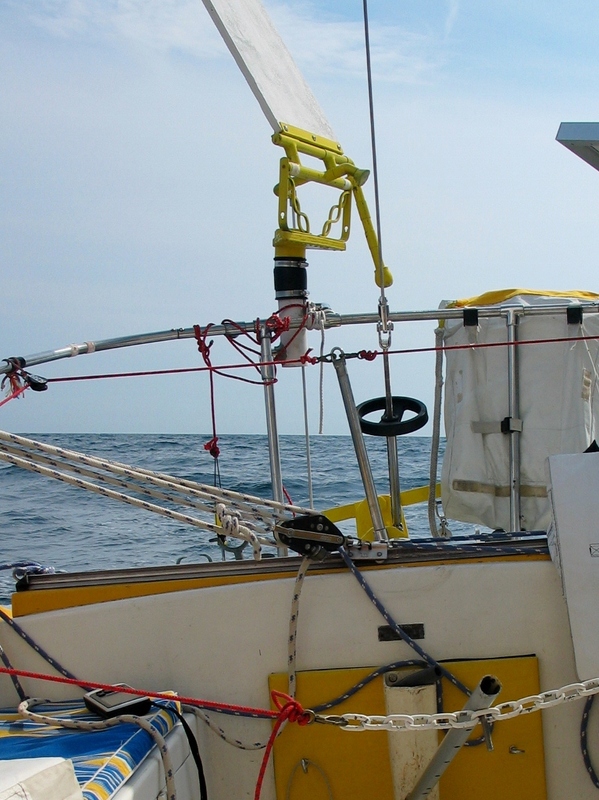 Our worst experience was with some heavy-duty Garhauer bearing blocks we originally bought for our main sheet -- they were destroyed during the course of a 200-mile passage. In any event, the power generated by the servo-pendulum is far more than enough to overcome any increased friction from plain-bearing blocks. As far the lines themselves, we use standard double-braid polyester lines. We’ve tried Spectra, but found that it slipped through the cam cleats. I also think that line creep may be more of an issue than line stretch in wind-vane applications. I don’t think that the stretch of double-braid polyester has any significant impact on performance. At the same time, this stretch provides a safety factor in the event of shock loads and overloading. This is all the more important because our system does not incorporate “fuses” to prevent overloading (the manufacturer recommends at least one block attachment with a breaking strength of 170 - 225 lbs, but we found that these attachments fatigued and broke very quickly). Instead of attaching the lines directly to the pendulum cradle, we run them through blocks mounted on the cradle. This doubles the amount of line travel -- the distance travelled by the line is effectively twice that of the distance travelled by the pendulum. This, of course, translates into increased wheel movement. Servo-pendulums deliver plenty of power to the wheel. 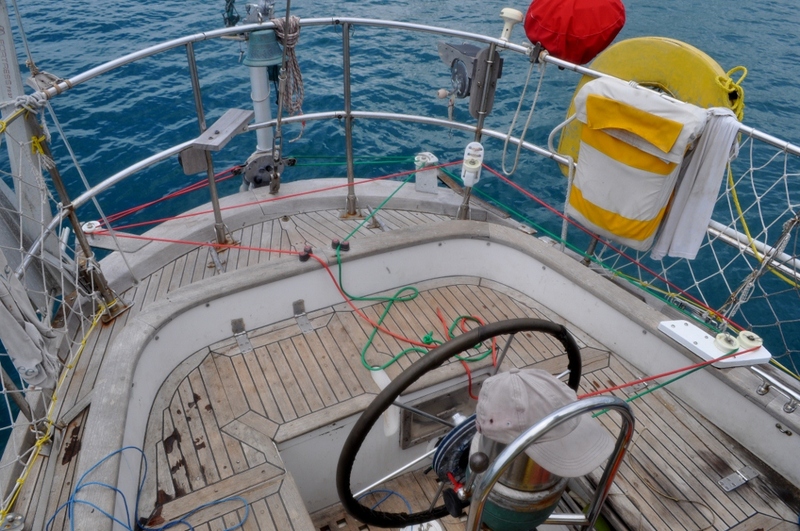 But without sufficient line travel, the gear will not steer the boat very well. The fact that the blocks are mounted slightly higher than the positions on the pendulum cradle also increases line travel a little bit. 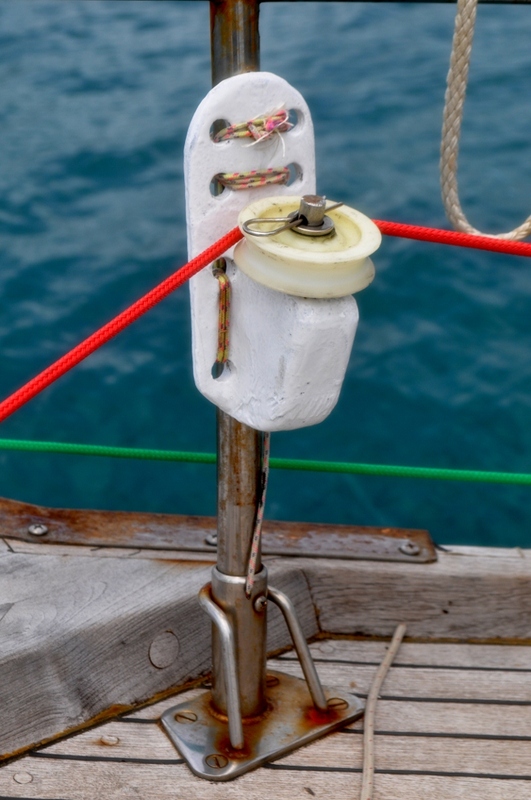 From the pulley on the pendulum cradle, one end of the line leads via pulleys to the wheel; the other end leads first to the 1/2” stainless bolt and from there to the cam cleat. This bolt functions better than a pulley or block because this is a fixed point -- the line does not move at this position (except when you’re making adjustments). In situations where the steering gear is working especially hard, the lines eventually creep a little through the cam cleats, introducing slack. This can be prevented by taking a few turns around the bolt before taking it through the cam cleat. Here's a not-enough-time-for-popcorn-long clip of Momo on the Indian Ocean.